Here at Pocket Farm we believe that rabbits are one of the most versatile yet underused livestock resources by the smallholders of this country. While they are farmed extensively in many other areas of the world they are almost entirely ignored in this country. Is this because they are more commonly thought of as a children’s pet here? Probably, and they are undoubtedly cute, but this aside they are also easy and cheap to keep, prolific breeders, excellent for small spaces and can be easily, legally and humanely dispatched at home . For anyone wishing to produce their own meat in a relatively small area and without the paperwork associated with other, more traditional, meat livestock then rabbits are most definitely worth investigating further. Although rabbits are perfect if you have limited space the ideal would be to allow an area large enough for them to ‘free range’ with hutches to sleep in and where they can display their natural behaviour. Obviously the space required will be dependent on the amount of rabbits you intend to keep but typically you may start with two does and a buck. Rabbits, as we know, are prolific breeders and produce large litters so, if they are mated immediately, in 30 days time your could have 20 or more to accommodate. If you don’t have space enough for a free range area then hutches with runs or a converted shed with access to an outside run can still provide suitable housing just remember that the very minimum area recommended should be calculated as 1sq foot per kilo of the anticipated final weight of the animal. Wooden hutches provide a nice consistent environment for your rabbits. Urine does soak into wood readily but as rabbits are a clean animal they will always foul in the same place allowing you to place a removable tray of some description in that area to avoid damage from excessive soiling. This will also allow you to collect pellets and urine more easily to be used as fertiliser or as a good source of nitrogen for your compost heap. You could also consider a cage with a small gauge wire floor, of the type often used for Angora rabbits, with some mechanism that will allow for collection of urine and droppings. Metal hutches tend to be to cold in winter and get hot in summer so are best used only if you are housing your rabbits indoors. For obvious reasons bucks and does will need to be penned or housed separately between matings and, unless you intend to dispatch immediately after weening, you will need another area with sufficient housing to keep the offspring until they have grown on enough. Rabbits bred specifically for meat tend to have lost the natural urge to dig constantly and therefore there is not as much worry that they will burrow out of their enclosures. You should be more concerned with keeping predators such as rats, weasels and, to a lesser extent with large rabbits, foxes out. Rats in particular will gnaw their way into hutches and steal food and young kits and can attack older rabbits too. There are some very good complete rabbit foods available, go for pelleted varieties as rabbits will pick and chose their favourite bits from the familiar style pet mixes meaning that they may miss out on some vital nutrition. Good quality hay should always be available in a net or cage to aid digestion and you can supplement their feed with treats such as chicory, dandelions, carrots, kale and even twigs to ensure a well balanced diet. Peach, plum and beech twigs should be avoided as should raw potatoes and too much lettuce. Always have plenty of fresh water available. What breed of rabbit to choose? If you are breeding for meat you will want a good size rabbit but some of the largest are slower to mature so medium breeds are often the best compromise. A very popular meat breed is the New Zealand White – a breed somewhat curiously named as it is thought to have been developed in the US where it is bred extensively for meat production. Other suitable varieties are the Californian White and the Beveran which originates from Belgium. Breeding rabbits can be found for about £10 – £15 each and although it is a little difficult to find them sold specifically for this purpose in this country suppliers are around and a local one can usually be found with a quick internet search. It is possible to produce a litter every six weeks, with females able to conceive almost immediately after giving birth, but this would be considered extremely intensive and allows the mother no rest at all. However, even on a much more respectful routine each doe can produce a litter every 12 weeks. Gestation is 30-31 days and the young are weened naturally at around 8 weeks old so it is easy to see that you could quickly become inundated if you are not careful. You should try to keep tabs on the relationships of the offspring if possible as, while there is not the same problems with interbreeding as you would expect with most other animals (which is another bonus), you should still not allow brother and sister to mate. Youngsters are not usually able to breed until about 5-6 months old but it is advisable to separate the sexes some time before this. A word of warning when introducing buck and doe for mating; the females can be very territorial and it is advised that you move the females to the males enclosure and not the other way around as they have been known to kill males that are introduced into their territory unexpectedly. Leave the pair together for at least an hour or more but it will rarely take longer than this. Tip: if you put them together again after about 2-3 weeks and the doe refuses the advances of the buck then it is likely she is pregnant. 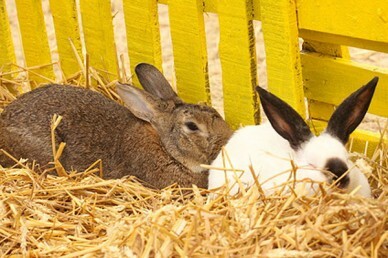 Pregnant females can be moved to a smaller hutch for the 3 weeks before kindling (giving birth). There they will make a nest from hay and fur plucked from their own undersides. Does may eat less or stop eating completely in the days before kindling. Kits will grow quickly and from 8 weeks they are referred to as ‘fryers’ because, at this age, they are very tender, from 90 day to 6 months they become ‘roasters’ and any older than that are called ‘stewers’ when the meat becomes tougher. If you do wish to dispatch at 8 weeks you may need to feed extra protein in the form of grain for increased growth. On a natural diet they will take about 3 months to reach dispatch weight. If fed and housed correctly your rabbits will be fairly resilient and should remain healthy. There are no approved drugs for meat rabbits in this country so if you do use medication remember that you will not be able to sell the meat directly to, or for use in products that will be consumed by, the general public. As with any animal observation is the key to keeping them healthy, rabbits seem to take pain and discomfort with even less fuss than other animals so it can be difficult to tell when they are suffering but any behaviour out of the norm i.e. hiding away or a change in their usual characteristics, should be investigated further. The plus side is that, unlike with chickens, most vets will be familiar with rabbits and their ailments and will be able to diagnose and treat them with some confidence. Another benefit of keeping rabbits for meat is that dispatch can be carried out by yourself at your premises without any special legal requirements. It goes without saying that this should be done as humanely as possible and ideally using a ‘stun and bleed’ method. Commercial stunners are available and will make the job easy and effective but can be expensive for anyone producing on a very small scale. Generally a sharp blow to the base of the skull with a suitable implement will render a rabbit unconscious at which point you should immediately cut the arteries of the neck and allow to bleed out for a minimum of two minutes. You could also use the broomstick method, a preferred method of chicken keepers, which is also widely used for rabbits. Videos of how to perform this can be found readily on Youtube. There are dispatch courses that you can attend if you would prefer to build confidence under the watchful eye of an experienced dispatcher. Youtube is also a good source of tutorials demonstrating preparation, including skinning and gutting, of rabbits. Rabbit meat is very low in fat and cholesterol and consequently can be lacking in taste on its own. For this reason stews, confits and terrines are all good ways of preparing tasty rabbit based meals.The loin (back section) all be the most tender with the hind quarters offering a slightly tougher but much bigger cut. The front legs, while much smaller, still offer enough meat to make them worthwhile including in a stew. Liver, kidneys and heart can all be reserved for use in a tasty pate recipe should you so wish. Try this twist on a straightforward stew recipe here or we’d love to hear from you if you have your own favourites that you would like to share. We think you’ll agree that the argument for rabbits as an alternative livestock are compelling. Add the fact that the pelts are easily cured and can be used to make garments such as hats or gloves or to line and trim larger items such as coats and I’m sure you’ll already tapping ‘hutch suppliers’ into Google. I currently have a small scale meat rabbitry. I started it for myself and it is my back garden. My question is do you sell to the public and if so, I’m interested in how you package the product. I am about to start selling from my house and would also like to get some rabbit into my local community shop and my local farm shop. I’m just unsure of which packaging to use. Im also, so I’m told by my local council health department, that it’s up to me to decide on an expiry date. Would you also perhaps offer me some advice on this. I started a series on selling to the public a while bach so perhpas this should be the next in line. Your local environmental health dept should have information or even an advisor you could talk to. You will have to register your site with the local authority I believe and have an inspection for the preparation area too. Keep any eye out for an article following shortly…. My question is; can I sell rabbit meat to the publick in London and if positive do I need to have any licence? I’m also based in Nottingham and whilst there are lots of articles on rabbit farming, I’m struggling to find any meat rabbit breeds for sale. Are there any breeders in the Nottingham/Derbyshire area?